“When Lotus 1-2-3 was first released, the program assumed that the year 1900 was a leap year, even though it actually was not a leap year. This made it easier for the program to handle leap years and caused no harm to almost all date calculations in Lotus 1-2-3. For further information on dates, please take a look at the other posts we’ve done on this topic in the past. If anyone has other date conversions they’re having trouble with, please let us know and we’ll see if we can help. For further information on Strata date conversion, please see this help page. In part 1 of this series, we looked at the basics of using calculated fields, including referencing fields and using functions. In this installment, we’ll look at how you can use calculated fields to extract data values from a column with “dirty” data. This happens more than one might think: if you’ve ever “cleaned” a list of contact information or migrated databases, you know that you often have to take a column and break it up into multiple parts. 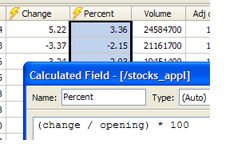 Calculated fields make this task very easy.